Haven’t decided on a hotel yet? You can look at other available hotels in the region of Emilia-Romagna with Booking.com. Cutting across the heartland of central Italy, Emilia-Romagna is bounded by the Po Valley to the north and the Apennines to the south. Since ancient days when the Romans built the Via Aemilia in 187 BC, linking the sea to the garrison town of Piacenza, agriculture has flourished, followed by arts and industry. Noble families and their courts attracted poets and painters, architects and sculptors, leaving a rich heritage of palaces and churches in the region’s cities and villages. Opera fans can make a pilgrimage to the birthplace of Verdi and Pavarotti, while luxury sports car aficionados can pay homage to where Lamborghinis and Ferraris were born. And above all, this region invites you to come eat. 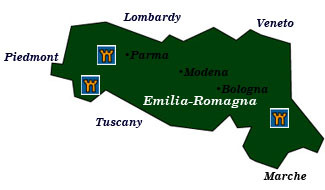 Emilia-Romagna is the home of prosciutto, Parmesan cheese, tortellini, and Modena balsamic vinegar. Parma This brilliant and prosperous city invites you to linger in a café over a plate of prosciutto and an aged parmigiano. Although its origins are Roman, feudal lords, the Farnese family, the Spanish and French all left their mark. Even the wife of Napoleon Bonaparte ruled the city for a time. Begin your visit at the cobbled Piazza Garibaldi, once the site of a Roman forum. Take a peek inside the Chiesa di Santa Maria della Steccata, a charming 16th-century church known for its dome and stunning frescoes in the dome’s arch. A short stroll away is the magnificent 12th-century Duomo, Romanesque on the outside and baroque within. Across the piazza you’ll find the Battistero, or Baptistery, with its pink stone Romanesque exterior and beautiful Gothic interior. Gaze upon several works by Correggio at Chiesa and Monastero di San Giovanni Evangelista. Modena Many people make a pilgrimage to Modena just to eat. Tear yourself away from any restaurant and take in its fine Duomo, now listed as a UNESCO World Heritage Site. South of Modena, car enthusiasts can spend hours in the Museo Ferrari, a museum celebrating the life of Enzo Ferrari and the history of his iconic cars from 1951 to the present. A showroom has plenty of Ferraris and Maseratis to drool over. Piacenza Of strategic importance since Roman days, this former fortified camp welcomes visitors to its fine old center filled with beautiful medieval and Renaissance buildings. At the Piazza dei Cavalli, so named from its two bronze equestrian statues, the 13th-century Palazzo Gotico is a is a wonderful battlemented and crenellated Gothic palace. At the Museo Civico, you’ll find Botticelli’s Madonna and Child with John the Baptist. The 16th-century Palazzo Farnese holds the Musei di Palazzo Farnese and an art gallery. Bologna Food and a wonderful historic city center (yes, in that order) are Bologna’s biggest draws. Its university is also the oldest in Europe. A stroll through the streets near the Piazza Maggiore reveals the world’s fifth largest church, the Basilica di San Petronio, begun in 1390 and still not finished; the Palazzo Comunale, an enormous building of various architectural styles, is a government seat that also holds the Collezioni Comunali d’Arte, an art museum with a collection of 13th- to 19th-century paintings. Housed in the nearby Palazzo Pepoli, get a great overview of Bologna at the Museo della Storia di Bologna, an excellent interactive museum devoted to city’s history. Highly atmospheric, unique, and charming, the Abbazia di Santo Stefano consists of four interconnecting churches boast architectural styles from the 8th to the 11th centuries. Ferrara Three centuries of the powerful Este family left behind palaces, a castle, and a charming medieval town that’s now a UNESCO World Heritage Site. Head first to the 14th-century Castello Estense, complete with towers, buttresses, drawbridges, dungeons, and a moat. The 15th-century Palazzo dei Diamanti (named after the thousands of diamond-shaped marble stones that decorate its façade) now houses the Pinacoteca Nazionale art museum and gallery, a showcase of 16th- and 17th-century “Ferrara School” art. The 14th-century Palazzo Schifanoia was one of the Este family’s pleasure palace, highlighted by a fantastic series of frescoes depicting the mythology surrounding the months of the year. Faenza For over 500 years Faenza has produced its distinctive blue and white glazed pottery known as faience. Its famed Museo delle Ceramiche is one of the largest ceramic museums of the world. Ravenna From the 4th to the 6th centuries Ravenna was the capital of the Western Roman Empire, leaving behind a heritage of superb and rich mosaics. Eight sites among tombs and churches are considered UNESCO World Heritage. San Marino Visit one of the world’s smallest countries (61 sq km) and its oldest surviving republic (since AD 301). San Marino’s three castles dominate the landscape, while views are spectacular. The historic town center and Mount Titano are inscribed on the UNESCO World Heritage list. San Leo In an impressive setting made famous by Dante in his Divine Comedy, this 15th-century fortress is the best in Romagna.